What kind of taxis do you ride in? Battered old Crown Vics? High-mileage Toyota Priuses or Ford Escape Hybrids? 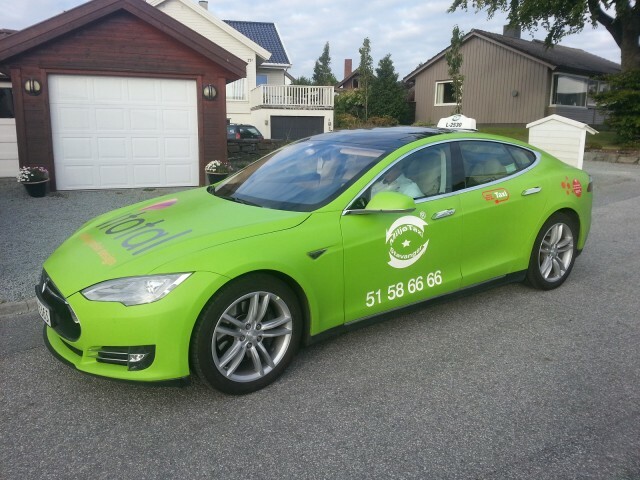 Our bet is that unless you've recently spent some time in Norway, you haven't ridden in a Tesla taxi. Given that country's huge incentives for purchasing and operating battery-electric cars, perhaps the luxury sedan was a natural. It's a five-door hatchback, making it easier to stow even large items or multiple suitcases on airport runs. It's smooth, quiet, relatively spacious in back--and the acceleration lets taxi drivers drive like...well, taxi drivers. Not to mention the low operating costs and the large battery that provides a full day's run without the need to recharge. Our reader Andrew Henderson sent us three photos of actual Tesla Model S taxis on the street in Oslo--and what it's like from the back seat. The fourth photo comes from the Tesla Motors Club, that source of almost everything related to the Silicon Valley startup electric-car maker. So on a summer Friday, sit back and imagine what it would be like if every taxi you ever rode in were a Tesla.